If you are following the progress on my Dugena mantel clock project it seems to be going fairly well though there have been some minor issues. I had no trouble taking the movement apart and cleaning all the parts to the best of my ability. Everything seemed to be in good order with minimal wear. My initial method months ago of dunking the assembled clock in a solution clearly did not work. The clock did not run at all after that procedure. So, I put the clock aside to decide what to do. Dis-assembly is the only way to do the job correctly as I am learning. After a thorough cleaning comes re-assembly. 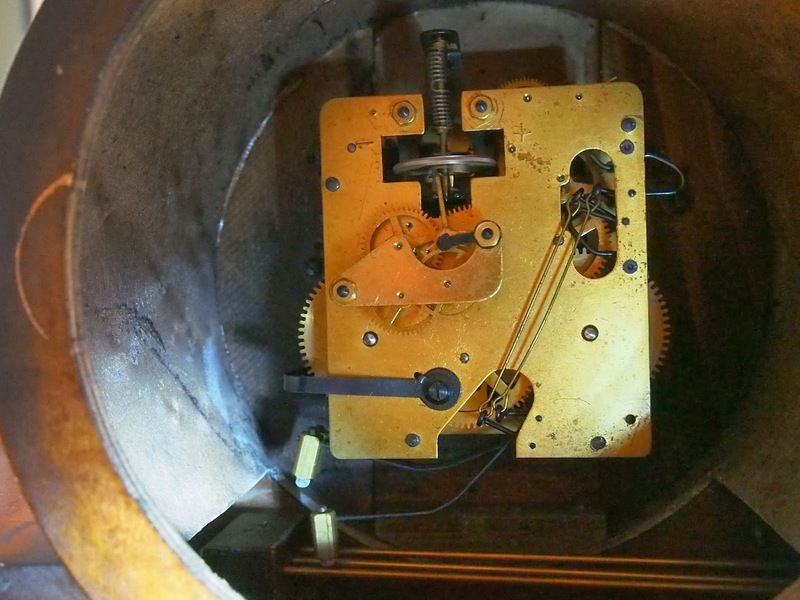 I have learned from taking apart movements that getting it back together means that once the back plate is on it is better to work from the bottom up, by getting the barrels in place, the main wheel and then working up to the top of the clock. Once I have the barrels in place I put on the lower nuts. I am not sure if that is the correct procedure but it works for me. I then use a pair of tweeters to carefully move the pivots in their proper place. The hardest part was re-aligning the hammer assemblies since the hammer wires are located outside the back plate. You can see this in the photo. 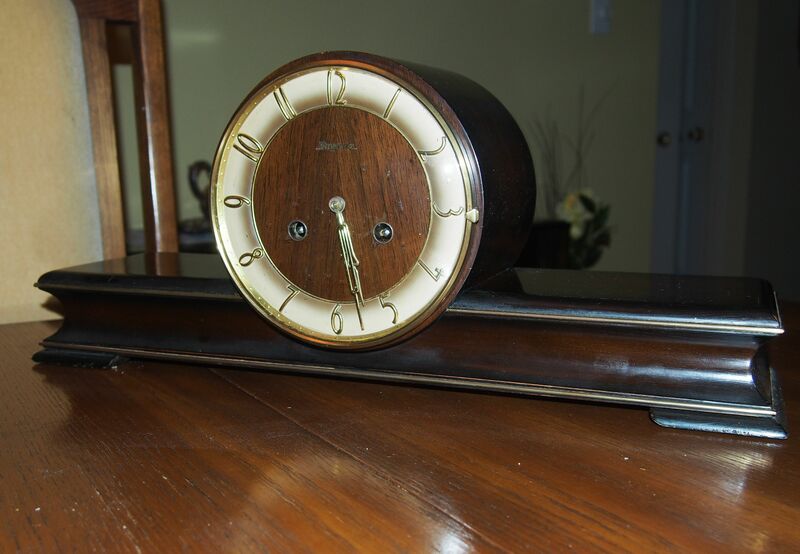 I later learned that even when the clock is fully assembled the barrels will come out by simply removing the winding arbors and sliding them out. It’s all good learning! It took a lot of fiddling to position the hammer assembly properly. With time (no pun intended) it all came together. Once the back plate was on securely next came the balance wheel escarpment and aligning the fork correctly which I think I did. I then put the clock in beat, oiled it and started it up. It did not run. Whoops, it needs power and had to be wound. I immediately noticed that the time barrel spring would not wind at all. I am guessing that the spring had, at some point become un-clipped from the barrel. I say un-clipped because I did not hear a broken spring sound. I switched barrels (#8S spring barrel) since they are the same for both time and strike. Once I got the barrels switched I gave the spring a few turns with the key, gave the balance wheel a little shove and the clock has been running for 24 hours as of this writing. Does it keep time, I have no idea at this point? I suspect it does with a little adjustment. As for the strike side, if I can re-attach the mainspring within the barrel I am on my way to re-installing the movement back into it’s case. I know the strike side is working properly because when I had the good spring on that side for a brief period the strike assembly seemed to be working as it should. Should I try to fix the mainspring or buy a new (or NOS) barrel and mainspring? I am not keen on fixing a mainspring because of potential injury but if I can scour around and get a used 8S barrel and mainspring for a reasonable price that would be the better option in my view. As I said, it’s all good learning!